This blog follows Andrew and Ian as they adjust to life living in Spain having moved from London in 2016. Buying a property, learning Spanish, cooking, cycling, writing, painting will all be part of the mix. Join them as they explore Andalucia and share their unique perspective on life in this beautiful country. Summer has arrived here in Granada Province, and the temperature has suddenly rocketed. The rather dreadful winter and spring has all but been forgotten now that we have endless blue skies, drying landscapes and beautiful balmy evenings. Warmer waters have brought shoals of jellyfish into shore which has rather deterred me from any dips in the sea. The stings I suffered last year are still too clear in the memory. On a positive note, with these higher temperatures comes impressive progress on the new house! Poor builders; we do not envy them. Since the build started two weeks ago, there has been incredible progress. All that remains are the exterior walls of the original 1850s house; everything else has been demolished and half of the garden has been flattened to make way for the extension. Every time we visit, something radical has changed. We went up to the village today, moving boxes from Casa Magdalena and into ‘storage’ while the build is completed. We took our now customary stroll down to see the works, and it is staggering how much has been achieved in so short a period of time. The first floor of the old house now has a brand new concrete floor and it is easy to see how much space there is now that all the small original rooms no longer exist. The builders were carefully chipping off years of interior wall rendering to expose the beautiful mellow stone that lies beneath. Where possible, we will leave this stonework exposed. At the rear of the house, piles of rubble, rock and earth are gradually being removed to allow for the laying of the footings for the extension. As the space is being cleared, we can see how large the ground floor is going to be, and we chatted to Juan (our builder) this afternoon about the prospective size of the kitchen and dining room and we can just about begin to see how the spaces will work. Once the footings go in, there will be yet another rapid stage as supporting structure and new external walls start to appear. We are beside ourselves with excitement! This week, we went shopping with our architects, and it struck us both just how hands-on and involved Ana and Jesús are in this project; they are literally guiding us every step of the way, down to the finest of detail. We visited a couple fo reclamation yards, one run by the inimitable Fernando and filled with absolutely everything that you can possibly imagine. The second is out in the sticks, not far from Granada Airport in an area called Chauchina and run by the equally inimitable Carmen; her warehouse was considerably less cluttered and suffered slightly from a rather doggy whiff, but it was here we found a pair of part-glazed doors, probably dating from the 1940s, that we want for one of our bathrooms, as well as a lovely panel of stained glass, also for one of the bathrooms. There was a sense of achievement that came with that first purchase! As we approach moving day rather rapidly, we have been nipping in and out of Granada a fair bit for both work and pleasure and, yesterday, we managed to find a new favourite place. A friend of ours, Kate, stayed at the Barceló Hotel Carmen some months back, when she came to Granada for a wedding. We seem to remember that Kate mentioned a roof top terrace at the hotel, but didn’t really have time to explore, and since then, we have read a couple of references to this ‘roof terrace’ and decided to explore. The terrace is on the 7th floor of this hotel that is located just opposite one of the main doors of El Corte Inglés, Granada’s main (only!) department store. As we climbed the stairs from the 6th to the 7th floor, we heard bar-like sounds and emerged onto one of the most delightful roof-terraces we have seen! There is a plunge pool tucked to one side, but the main terrace runs along the width of the hotel and down one side and I would say that the views must be among the finest in Granada. Everyone talks of the views of the Alhambra Palace from the Mirador de San Nicolas in the Albaicin, and these views are indeed very special. 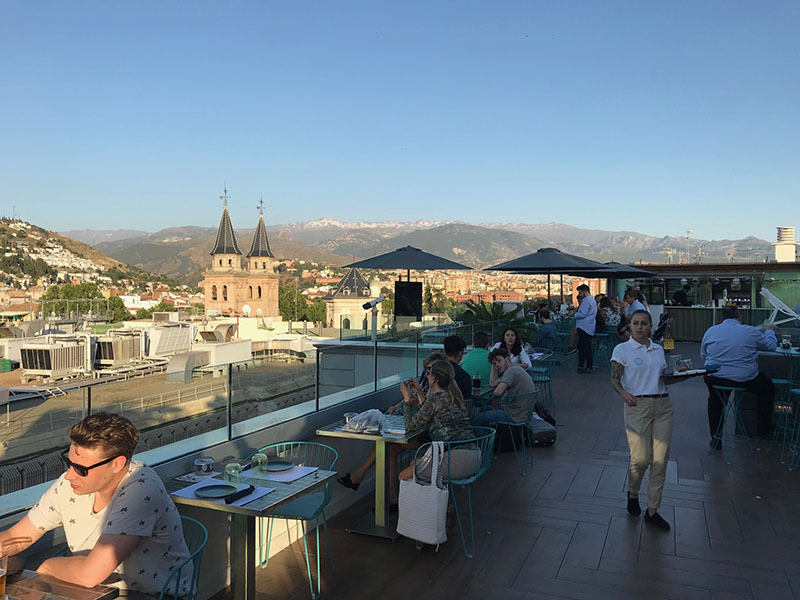 However, from the Hotel Carmen terrace, the view takes in the Albaicin, the Alhambra, the Realejo and then across to the Sierra Nevada mountains. In other words, you get to see all the historic parts of this beautiful city in one sweeping panorama. We sat at a table, and were able to remind ourselves just what a beautiful city Granada is - the older parts of the town tumbling down from around the magnificent Alhambra, punctuated by soaring cypress trees and with a backdrop of the Alhambra Woods. The twin spires of the Basilica de Nuestra Señora de Las Angustias rise up, set against the stunning Sierra Nevada beyond in a scene that would not look out of place in Salzburg. Granada is gripped by World Cup fever, and last night saw Spain beat Iran 1-0, and there are screens everywhere so that Granadinos can still enjoy a drink outside and not miss a minute of a match. It’s all so good-natured and respectful, and after our Gin and Tonic and Negroni we rather wished we’d stayed on this terrace all night and watched the glow of the setting sun reflect off the ancient stone walls of the Alhambra, seen the sparkling of little lights gradually appear across the hillside of the Realejo and witness the soft changes of colour on the majestic mountains beyond. If the laying of floors and building of walls in our new house becomes a little too much, then you know that you’ll find us on this rooftop, gin in hand and ne’er a care in the world! Radio presenter, voiceover, business consultant, teacher of English as a Foreign Language, would-be author and artist, baker and co-owner of a boutique B & B. Living a charmed life in Andalucia and sharing stories with anyone who fancies reading them. We respect your privacy. We will not pass your details on to anyone. Thanks! You'll receive our next newsletter. Don't forget to check the blog regularly for new posts.